We had heard rumors that Samsung was working on new Chromebooks and the company has officially announced them today at the Consumer Electronics Show 2017. Designed in partnership with Google, Samsung says that the new Chromebook Plus and Chromebook Pro have been “Designed for Google Play,” that’s because both notebooks come with the Play Store installed straight out of the box, allowing users to easily install and use Android apps on the Chromebooks. The idea with these notebooks was to provide the power and productivity of a laptop without compromising on the flexibility and versatility that a tablet offers. Both models feature a 360-degree rotating touchscreen, a quad HD resolution display and a built-in digitized pen packaged in a new lightweight metal design. 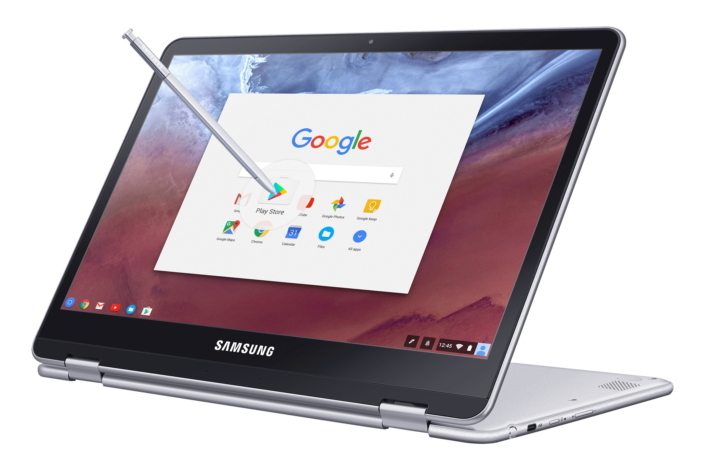 “With the Chromebook Plus and Pro, we’re partnering with Google to pair a sleek design with supreme flexibility, encouraging users to experience more with Google Play and Android apps, while continuing to provide simplicity, top-rated security and shareability inherent in Chromebooks,” said Alanna Cotton, vice president of product marketing at Samsung Electronics America. The 360-degree rotating touchscreen display of the Chromebook Plus and Chromebook Pro allow the device to be used as both a notebook and a premium tablet. For the first time in Samsung’s Chromebook lineup, both models feature a built-in pen which is embedded on the side of the device. The pen enables users to easily take notes and capture on-screen content. The Quad HD 2400×1600 pixel resolution display on these notebooks has 3:2 aspect ratio and is protected by Gorilla Glass 3. The Chromebook Plus and Chromebook Pro come with updated ports which include two USB Type-C ports and have support for 4K video streaming. Samsung Chromebook Plus has an ARM hexa-core processor while the Chromebook Pro packs an Intel Core M3 processor. Both have 4GB of RAM, 32GB of storage, a 720p front camera, and a 39Wh battery that promises eight hours of usage on a single charge. Samsung will start selling the Chromebook Plus next month via major retailers with prices starting at $449. The Chromebook Pro will be available later this spring which is why its price hasn’t been revealed yet. I still don’t see the point in a chromebook. It’s much less functional than a Windows PC and I can install Chrome browser on my Windows PC.